Space Ace represents the second laser disc effort from Don Bluth and Rick Dyer. In Space Ace, you take on the roll of "Ace" who is attempting to rescue "Kimberly" from the evil "Commander Borf". 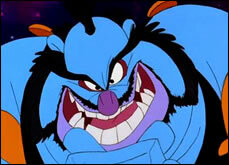 There are a couple of features that make Space Ace distinct from Dragon's Lair. First, "Borf" has an "infanto-ray" which can turn the hero "Ace" into a scrawny kid named, "Dexter". During the game, you switch between these two roles (Ace and Dexter). The other thing that makes Space Ace unique from Dragon's Lair is that you are allowed to choose the difficulty level when the game starts ("Cadet", "Captain", and "Ace"). Dragon's Lair had difficulty levels but they were determined by dip switches in the cabinet. While I saw Space Ace at multiple arcades when I was a kid, the place that I played it most was "Rockwood Lanes", a bowling alley near my house. 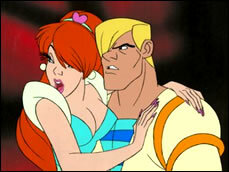 In fact, that might be one of the reasons that I don't like Space Ace nearly as much as Dragon's Lair. Every time I see a Space Ace machine, I remember the cigarette smells combined with the stench of old shoes that flowed from that bowling alley. Another reason that I don't like it as well is that it has full voice acting. While many people might see this as a positive, I actually appreciate Dragon's Lair for the fact that I don't have to hear Dirk's voice (grunts aside). Dexter's scrawny voice for some reason just didn't appeal to me. On a related note, I don't think Link (of Zelda) should ever have a voice (although many people want him to), I think it would have the same negative effect on me. As you can see from the pictures below, it was my original intent to restore the cabinet (which ultimately became Space Ace) to a Dragon's Lair. However, about half way through the process I found a much cleaner conversion of a Dragon's Lair on eBay and decided to restore it, leaving this one to be a Space Ace. You can check out my Dragon's Lair restoration here. The actual restoration to Space Ace was quite an undertaking. The original cabinet had been converted to "Cobra Command". I would not be lying to say that this was the worst conversion I have ever seen. The cabinet was completely hacked, the original control panel had been replaced with a poorly fitting one, the angled screen had been converted to be completely vertical (the score board area was removed), the top had been chopped, and the sides were badly damaged. Through the help of several friends and family members, we were able to rebuild several of the cabinet pieces to restore it to a Dragon's Lair/Space Ace cabinet. As far as the actual electronics and related cabinet parts go, I had to acquire pretty much everything off of eBay or via retro arcade part suppliers. This includes the laser disc player (a LDP-1450 w/ a Hi-Tech Laser Disc Conversion Kit), the scoreboard, the volume control, the power supply, the PCB, the wiring harness, the marquee, the marquee rails, the bezel, and the artwork. I also obtained a couple of Space Ace laser discs, both which play all of the way through but have some degree of laser rot (sadly).